"A WET WEEK HERE IN THE NORTHERN FOREST!" Yes, it was a wet week here with rain on Monday, Wednesday, Thursday and snow on Friday. Along with the rain was warm temperatures. However, the snow recieved on Friday & Friday night resulted in 1" of snow on the ground for Saturdays training run. Due to the warm/wet weather, we were only able to get in three days of training. The dogs are all doing great and even the two yearlings that were having problems have figured it out and are also doing great. I am very happy with the dogs conditioning and their increase in speed. They are now running with three minute intervals with two minutes rest. A Mohawk friend of mine sent me this Mohawk Fable that gave me a laugh, so thought I would share it. "FALL TRAINING IS THE TIME FOR TEAM DEVELOPMENT IN THE NORTHERN FOREST!" This is a great time for experimentation & development in the teams with running dogs in different positions and different pairings. In the photo, Stormy is being introduced to the lead position and running along side Cosmos. Stormy, so far is taking to the new position with enthusiasm & confidence. Cosmos, who was just introduced to the leaders role, is doing a great job and is enjoying his new role in the team. Both of these new leaders have no problems with "head on' passing of other teams and are a great compliment to each other. Stormy in the a team position is obnoxious with her desire to go when stopped to rest. However at the lead position, she is in her element with her enthusiasm to go stimulates the team. With time, these two could be the race leaders of the future! It was a good week for training the dogs, getting in another four days of running of two teams/day. The yearlings are progressing nicely with the one who was a slower starter getting more confidence and developing to be a good runner. However, one of the yearlings that started off great, has regressed and not sure of itself at the start of the runs. However, after a mile into the run he kicks in and runs with enthusiasm. With patience and perseverance, all should develop into great sled dogs. Training young dogs is no automatic nor instant success. It takes time to develop young dogs. The weather this week is changing with colder, frosty nights. One night, we even had a dusting of snow. The forecast for the coming week is for warmer days and mostly rain. I hope this changes as the week unfolds. "REST & RELAXATION IN THE NORTHERN FOREST!" Yes, there is time for R&R here at Miortuk. Here is a photo of Kara returning after a morning of Kayaking on Lac Charland. It was also a great week for running the dogs getting in 4 days of running 2 teams/day. The dogs are all doing great and with the dogs getting into better condition the speed on their runs was allowed to increase to 10/12 mph. However, the running intervals is still 2 minute run/2 minute rest until the 4.5 mile trail is covered. The dogs are now being stopped about 200 yards from the kennel and after a rest allowed to sprint back home. This is training them to run fast after the command "GO HOME!" is given. Due to the weather forecast we ran three days in a row with a two day rest and then trained again on Friday. This was followed again by a two day rest. This comming week, I would like to run two days , off one day, run two days and then two days rest. On Fridays run, we experienced some drizzle and ice pellets while training. Soon, the Winter weather will be apon us. 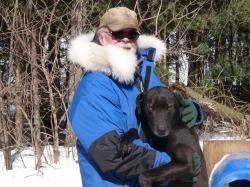 A couple of years ago I wrote a book on mushing & my experiences with the same. In the B.A.R.K. section, I am making a special offer to those who wish to make a donation to help feed the dogs. If your interested, please visit that page for details.
" FINALLY, FALL CONDITIONING HAS COMMENCED IN THE NORTHERN FOREST!" Finally this week, we were able to get out 3 days for conditioning runs. In the photo, Willy & Coyute await their after run watering. The runs this week were important as they were the first run for all last years litter. This first team ran with Lizzy, Sophie and Nicky along with nine adults. The second team had Annie, Katie, Willy and Vickie running with eight adults. The first group ran like they had been doing it all their lives. However, the second group acted like yearlings getting crazy with each other and thier partners and not doing what their expected to do. This is the reason, that yearlings are paired with an adult who will discipline them and teach them what to do. After the first 1/2 mile three were running correctly and after the first mile all had figured out what was expected and ran a great 3 miles. I keep the runs to 2 minute exercise and 2 minute rest periods until the 4.5 miles is completed. This is important to not only for conditioning, but also to prevent stressing the young dogs out. The rain continued for the whole week, making it difficult to get the runs in. However, cooler temperatures arrived at the end of the week and the forecast for next week looks great.